"The Brief Military Career of Private Lawrence Edward Freeze" was written in 1999 and presented at the Phi Alpha Theta Regional History Conference at the University of Tennessee in Knoxville in March 2001. Revised in June 2011. For a good introduction and overview of World War I, see Norman Stone, World War One: A Short History (Basic Books, 2009). 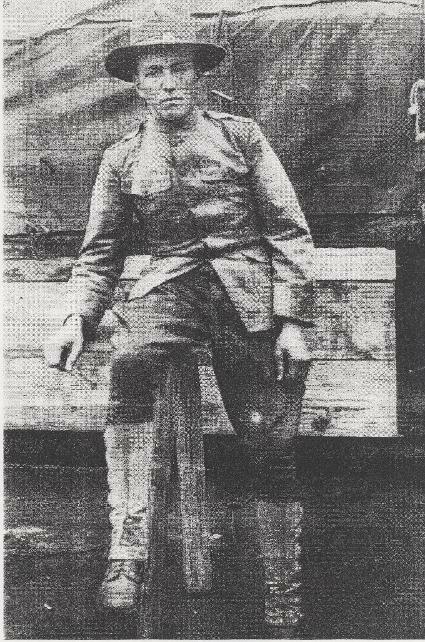 PVT Lawrence Edward Freeze. Postcard photo, location and date unknown. From the Personal Collection of Martha Swanger, Manchester, TN. 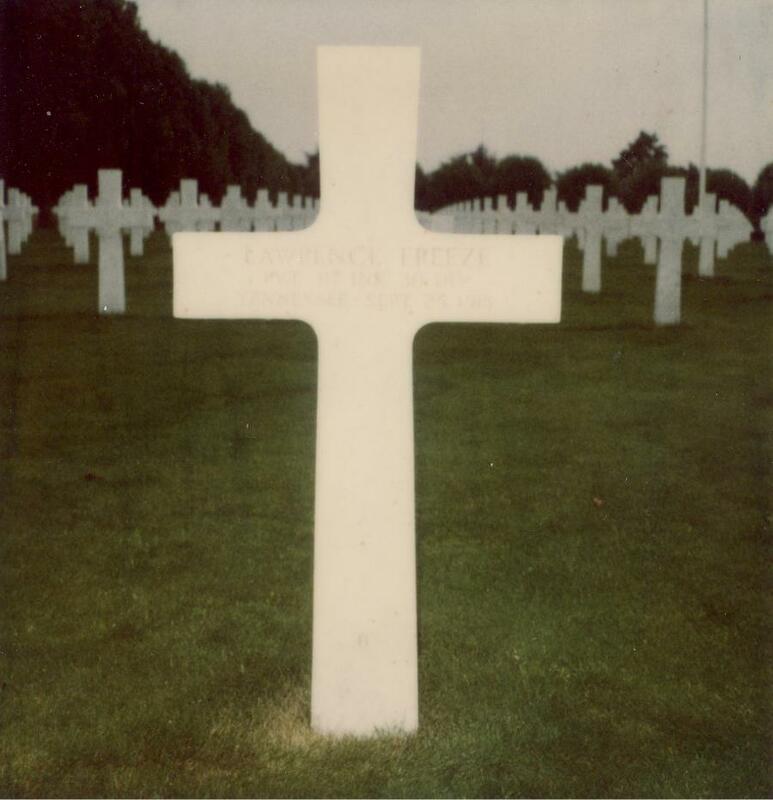 The Information about Somme American Military Cemetery and Memorial, by the American Battle Monuments Commission, is an information sheet with a map of the cemetery and a page of selected headstone epitaphs. The ABMC Commemorative Sites Booklet as well as Somme American Cemetery Visitor Booklet are available online. The Correspondence about PVT Lawrence Freeze includes two letters from Colonel William E. Ryan, Jr., Director of Operations and Finance of ABMC, dated July 24, 1992, and October 22, 1992, to Basil R. Fletcher, Sr., my father. Also included is the response from the National Personnel Records Center, no date, to my formal inquiry, probably around 2005, to obtain additional information and possible medals awarded to my uncle. If you read the letter, you will see that I learned very little, since as a nephew I did not qualify as "next of kin." The honor of the World War I Victory Medal for my uncle who was Killed In Action was assumed before I sent the request. Help to access the Tennessee World War I Gold Star Records is available online. "The World War II Stint of Basil R. Fletcher, Sr." is based on personal interviews with Sergeant Fletcher, my late father (b. 1923, d. 2010), who served in Papua New Guinea in an army signal corp unit during World War II. He always was very proud of his service in the United States Army. He spoke positively about his military experience and maintained contact with members of his unit as long as he was able with cards, letters, and attendance at reunions. For an excellent, concise overview of World War II, see Gerhard L. Weinberg, World War II: A Very Short Introduction (Oxford, 2014). Standing: Lt. Francis P. Boudo, Lt. Charles W. Duffy, Lt. Alan L. Cameron, and Capt. George W. R. Wilson. Kneeling: Pfc. Robert Klein, Sgt. William E. Manuel, Cpl. Dominic S. Del Torto, 1st Sgt. William Kolar, and Sgt. Basil R. Fletcher. Lt. Alan L. Cameron, Sgt. Fletcher, and Their "Buddies"
Letter from Sgt. Basil R. Fletcher ("Somewhere In New Guinea") to Parents, Vernon and Ruth Fletcher (in Summitville, Tennessee), dated 19 May 1944. Nelda is Sgt. Fletcher's younger sister. "The Laundry" was at Camp Forrest in Tullahoma, Tennessee, where Sgt. Fletcher worked prior to his enlistment. Camp Memorial Park (entrance above) in Fayetteville, Georgia, is where my maternal grandparents, Ralph and Vessie Winn, are buried and has a nice plaque (shown below) to honor all U.S. veterans. "Draft Registration and Student Financial Aid" (March 2005) surveys the complicated legal issues that have been used to decide cases challenging the constitutionality of linking student financial aid to male draft registration for military service.